The Tales series is one that I've always wanted to admire... but no, I had to be born, raised and living in the wrong country to actually experience these games. I'm not sure if Namco has no faith in the Tales series selling well in Australia or in general, because in Australia, we only have Tales Of Symphonia and Tales Of Vesperia available. 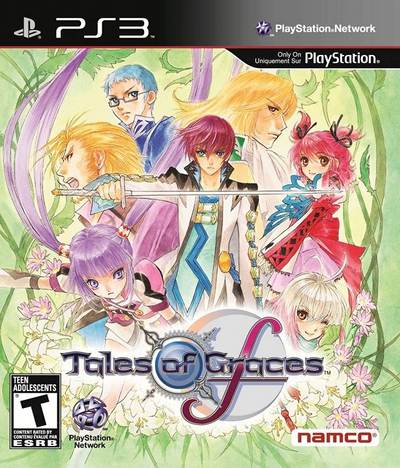 In fact, had it not been for the fact that the PS3 is region free, I would never experience Tales Of Graces F, and although I would definitely say that Symphonia and Vesperia are better games, Graces F is still a good game that is well worth your time. I do have a couple of issues with the story. First off, the story itself isn't a particularly engaging one, and after a while, it becomes all too easy to ignore. Hell, the game doesn't give it much mind, only developing it every now and again to remind you that there is, indeed, a story. It's not terrible, don't get me wrong, but it's not really that good, either. The other problem is that the first five hours are practically a snoozefest because not a whole lot actually happens. The idea is to set up the characters for the rest of the game so that they can develop as it goes on, but a lot of the time, I just wished that it would move on. Like, I get it, they want to establish the characters and the events to come, but given that it moves at a snail's pace, well, let's just say that it's better not to play this near any pillows. But from that comes a huge strength – the characters. I've found myself really getting attached to them as the story progressed due to the development put into their relationships. Since Asbel basically abandoned his brother and friends over a seven year period, he has to build his relationships back up because when he goes back out into the world, they give him the cold shoulder. As well as the development of their relationships, you have how they all interact with each other, and that's where the skit system comes in. Every now and again, you'll be prompted to press select to listen to the characters talk amongst themselves about stuff, like their current situation or themselves, leading itself into character and plot development, but most of all, it tends to be humorous. It's just how these characters interact with one another and how well their personalities play off each other that keeps the game engaging, plus with themes such as friendship and protecting your friends cropping up a lot, you better hope that the characters are good, and that they are. Not quite Resonance Of Fate good, but we're getting there. While the story steps more into familiar territory, the gameplay has actually changed a fair bit. For one thing, the overworld is scaled down to one big island and it isn't as big as you'd expect it to be. While it's not like Final Fantasy XIII's ultra linear world, it is easy to lament the loss of a much more open world in a Tales game. There are little nuances like "Discoveries", which basically give you items that are often accompanied by skits. Beyond that, the overworld doesn't offer much and backtracking through it without transportation items is a chore and a half. Combat is quite different too. While the other games had you mashing the attack button for combos and pressing the special attack button while moving the left analogue stick for special attacks (or Mystic Artes as they're called), this one has more rhythm and strategy to it. See, there's this thing called the Chain Capacity, which basically replaces TP (or MP if you will) and not only depletes when you use Mystic Artes, but also regular attacks. What this means is that you'll need to make sure your attacks will work, lest you lay your CC to waste. Thankfully, it is easy to replenish it by guarding (well, standing still, really, but guarding is usually what you'd do), though that's not the only way to replenish CC. See, you can do this thing called sidestepping, which has you dodge an enemy's attack, though that costs CC to use. Thankfully, you can profit from it too, especially if you time it just right. Mystic Artes have had a sort of overhaul as well... well, not the Artes themselves, but rather, the means of acquiring them. Rather than getting to a certain level and using certain special attack(s) often enough, you learn them through equipping titles (which not only gave you special attacks, but also stat increases), and then using SP (or Skill Points) to actually learn them. Then there are special Mystic Artes, which are much more powerful than regular Mystic Artes, but can only be used when in Eleth Burst mode, activated by filling up the Eleth Guage through attacking and getting attacked. These Artes can only be gained by equipping special titles or through events in the story. Dualizing is a new feature... funny how it took the series this long (and by this long, I actually mean 2009) to let you fuse items together, but better late than never, I suppose. Whether you're fusing weapons or armor together or with gems to upgrade them or raw food ingredients to make a juicy snack/drink, it's a system that works. What makes it even sweeter is the Eleth Mixer, which will give the combined item a bonus if you fulfill a certain condition in a battle. This makes getting the best items – whether it's in terms of equipment, consumables or stuff you can pawn off for quite a lot of money – easier than just finding them out on the field or some dungeon... just as long as you're at a shop or at certain other locations, because that's the only place where you can do it. For a Wii port... actually, even if it wasn't a Wii port, it's a pretty good looking game. A misnomer is that the textures aren't that good because it's a Wii port, but actually, it's just that the cel shaded anime style doesn't allow much room for realistic textures without looking out of place. Besides, it still looks pretty good. The colors help create a vibrant world full of life - even if the camera can't be controlled to get a good look at it, there's still a sense of scale, like there's a big world to explore, full of people that need saving. But where the graphics shine are in the battles, with plenty of flashy effects and colors to make them look as fast paced as they are, which is quite fast. Not to mention, the skit style works very well. It doesn't stop with just showing character portraits instead of putting heads in boxes – it starts from there, gives them a wide range of different visual emotions, and uses them all to great effect, helping to make each of the skits very entertaining. If there is anything I can criticize, it's that the character models tend to look like plastic dolls, with big heads and small bodies, and wide open glass-y eyes. Although it's a traditional design choice, it's just really distracting here because their heads just seem bigger and their eyes wider... ah well. But I'm going to be honest in saying that the soundtrack... is pretty underwhelming. Not terrible, per se, but more often than not, a song just doesn't have the oomph that it needs to really stand out and make a situation really go off. I'm sorry Motoi Sakuraba, I know you tend to compose great soundtracks (especially the soundtracks to Tales Of Symphonia and Resonance Of Face), but I think you were just having a bad day here. Each song suits the situations finely, trying to convey the right mood, but without the oomph, it's just suckling on hind teet. The voice acting is pretty hit and miss. Some, like Pascal and Sophie, sound excellent, especially Pascal, who really draws me into each cutscene with her vocal patterns matching her hyperactive personality. However, stinkers like Richard are painful to listen to, sounding like an obnoxious announcer anytime he has to put even the slightest bit of emotion into his performance. As for the rest, they work okay, but half the time, I'm aware that I'm playing a video game as their performances tend to feel phoned in. Overall, not the best this series has to offer. Don't get me wrong, Tales Of Graces F is a very good game, and besides the sound design, whatever flaws it has are small and are easily ignored because they're sandwiched between what makes this game shine. Linear exploration in a worth without much to do and with backtracking? The battles and skits you'll encounter are a lot of fun and the graphics will more than make up for that. The first five hours? The payoff for enduring them is well more than worth it when they blossom into excellent characters with entertaining exchanges between each other. The story not having much to it? Hey, the characters are well more than enough to keep you entertained. But it's not just good stuff compensating for the bad stuff – the battle system and skits are all very well crafted and a lot of fun to go through. Perhaps it's not the best in the series, but it keeps up the Tales tradition of not having a bad game in the mix at worst, and is still a fantastic game at best.